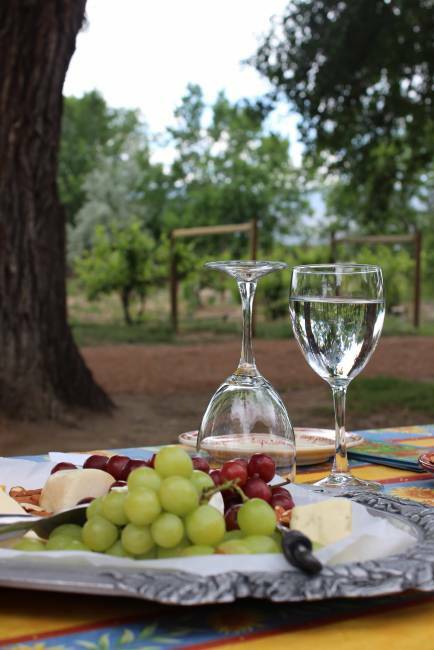 The Winery at Holy Cross Abbey, located in Canon City, Colorado and has been welcoming visitors since 2002 to enjoy their beautiful, serene setting and taste their award-winning wines. The tasting room is open daily, year-round and most of the samples are free or $1. The staff at the Winery at Holy Cross Abbey will guide you through your flight tasting of Riesling, Syrah, Merlot, Sauvignon Blanc and much more. Each year, the Winery hosts the Harvest Festival. This annual fall event features local wine, artisans, food and entertainment for all ages. The Harvest Festival usually occurs at the end of September. This monastery turned winery offers an intoxicating amount of history. A former monastery of the Order of St. Benedict came to be in 1886 when two Benedictine monks were sent from St. Vincent Archabbey in Latrobe, Pennsylvania and traveled to Colorado to establish a monastic community in what was still frontier territory. The monastery was built in the Gothic Revival style and was raised to the status of an Abbey at that time, and assumed it's current name. Upon it's completion a boarding school was opened and the first attempts of establishing a winery were made. The abbey saw its enrollment numbers rise during the 1950s and 1960s, only to see a steep decline begin after that with an official close in 1985. In order to find a new means of financial income the Abbey's remaining 20 monks decided to return to the idea of establishing a vineyard again in 2000. They entrusted the production to a professional viticulturist who began to produce wine the following year. In 2005, however, it was determined that the monastic community was no longer viable and, in a final chapter meeting, the monks voted to dissolve it. Today, the Abbey is open to the public as a winery and tasting room. The Winery at Holy Cross Abbey was featured on Day 2 of our epic adventure 55 Attractions in 5 Days. See the complete list of attractions and watch the Day 2 video. Don’t forget to save with area discounts & deals on lodging, attractions, dining and more!